This is a super kid-friendly meal, and actually great for babies just starting on table food. A much healthier alternative to canned soup, and amazing on a cold day! Stella means “star” in Italian, and pastina is “little pasta.” I know you’ve seen the tiny star pasta in the grocery store and loved it but wondered what to do with it. I’ll tell you! This is a really easy, flexible dish. You can leave it wet and serve it as a soup, or drain the broth for a creamy pasta dish. Any shape of dried tiny pastina pasta is fine, but my kids like stars the best (sometimes labeled stelline in the store), and they cook the quickest. This is a great meal to make with leftover chicken, but you can add any other meat or vegetables that you have on hand. 1. In a medium saucepan, bring the broth and carrot to a boil over medium heat. 2. Add the pastina and cook until tender, about 6 minutes. During the last minute or so, add the chicken to heat it through. 3. Remove from the heat and stir in the mozzarella. 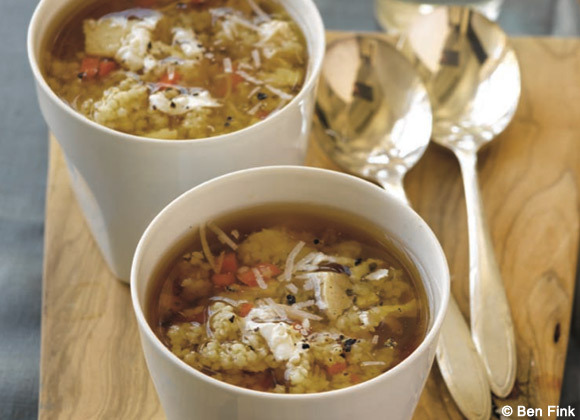 Ladle into bowls and serve hot, with the grated Parmigiano cheese passed on the side.